I hacked a triple bunk bed, by nesting the IKEA TUFFING bunk bed under the loft bed. However, I am unable to take a photo of the finished hack because I do not have access to it. But using IKEA assembly diagrams, I will show you how to build it. I’ve also put in measurements to show why it works. 1. Build IKEA TUFFING loft bed frame following instructions given by IKEA. 2. Place loft bed on bed risers to raise the loft bed higher. This gives greater allowance for the bunk bed below. 3. Cut each of the bottom of the legs of the IKEA TUFFING bunk bed 5.5 inches (just below the bolt holes) using your hack saw. This effectively lowers the bunk bed. 4. Build IKEA TUFFING bunk bed as usual. 5. Nest the IKEA TUFFING bunk bed underneath the IKEA TUFFING loft bed. You’ll need additional hardware to attach the loft bed to the wall. 6. If desired, place steps or ladder where necessary. Two Kura beds and a few square meters of spruce boards provides bunk beds for 3. And the colored LED lights give the wow effect when the “city skyline” lights up in the evening! 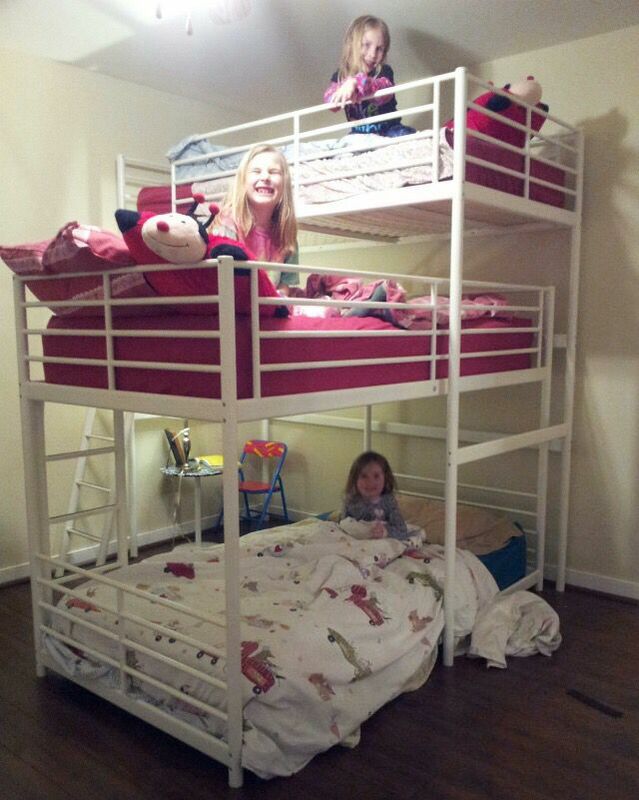 Save space in the children’s bedroom with this triple decker. Next ArticleIKEAhackers book sneak peek: Who’s behind this DIY Cabinet? Please take down this hack!! It doesn’t work!!!! We bought the beds and went through this whole process and the bunks DO NOT FIT UNDER THE LOFT. Hi Jules, thank you for the reply! I did check your investigative work and you were correct! However, when it is assembled, I can assure you they are the exact same length to the T. We tried tightening the bunk as much as humanly possible, and loosening The Loft to try and wiggle it in. Nothing worked. The legs of the poor Loft were bowing so much we thought we would damage it for good. I gave up. I am just going to turn the bunk and do an L. It’s not what I had in mind but it’s something. So, I have assembled the loft bed and I’m getting ready to put together the bunk bed. I assured my husband and I had a plan and he ought to just leave me to it! Now, I am desperate not to look like any dummy, and it looks as though that’s where I’m headed. How do you nest the beds when they are the same length? I’ve seen other people asking, but no answers. Also, with metal cylinder legs, the bed feels very unsturdy on the risers. Any tips for that? On IKEA’s website, the length of the bunk bed is 77 1/2 ” and the loft bed 81 7/8 “. There appears to be some leeway to squeeze the bunk bed under. As I’m a very capable and handy person, I’m currently building this hack based on your instructions. Sad thing is, like Jo said, the bunks and the loft bed are the same length (reading is fundamental). I’ve been looking for a cheaper triple bunk solution, and this rocked. Also, the middle bunk gets cheated on headroom, not big deal, but the middle child already gets the short end of the stick at times. I’m trying to figure out how to offset the build and see what happens. I’m wondering how sturdy this is on top of risers? Does it hold up to active children? Curious- the length of the loft bed and the bunk bed are (according to ikea website) the exact same length. How did u fit something 197cm in length inside something that is 197cm in length? Love to hear how you overcame this.